Tyrone set up an all-Ulster All-Ireland semi-final with Monaghan at Croke Park next Sunday with an impressive win over their hosts Donegal at Páirc Seán Mac Cumhaill in Ballybofey. This was a winner-takes-it-all encounter, whoever came out on top securing second spot in Group 2 of the Super 8s. Early in the second half, trailing by four, Tyrone looked out of ideas and on their way out of the Championship. 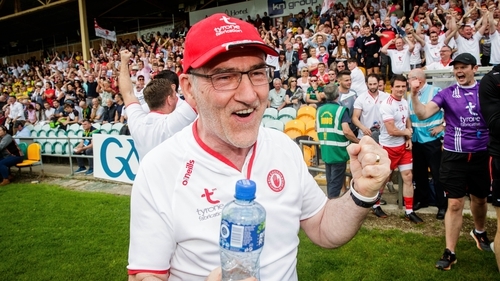 But manager Mickey Harte made the changes that counted, turning to his bench and having his faith repaid with 2-05 from his second half replacements. A cautious first half gave way to a far more open and attacking second period, the visitors in particular cutting loose with 2-11 after the break in this local derby played in a town that nudges up against the border between these two counties. With their season on the line, Tyrone were quicker and more direct after the change of ends and Harry Loughran’s goal eight minutes from the end of normal time the game-changer. They added three of the next four points and from here Donegal were going to need a goal, something that isn’t easy to produce against a team that defend as well as the Red Handers can. They bottled up, turned over and stripped the ball carrier and were more than good value for their win and their second place in the group behind four in-a-row All-Ireland chasing Dublin, who face Galway in Saturday’s first semi-final. This will be a repeat of their Ulster semi-final, which Monaghan won 1-18 to 1-16 on 20 May so motivation shouldn’t be a problem. Even in the 12 minutes of stoppage time referee Joe McQuillan played Donegal weren’t able to find a way through. Both teams made changes for the start, Eoghan Bán Gallagher recovering from what was feared to be a season-ending injury and Eamonn Doherty starting for Donegal in place of Paul Brennan and Niall O’Donnell. Mark Bradley came into the Tyrone team, taking over from Hugh Pat McGeary and they needed a further defensive reshuffle just five minutes in when corner-back Micahel McKiernan trudged off after his black card for a foul on Ryan McHugh. For long periods this was as cagey and confined as expected and scoring opportunities were at a premium. Tyrone’s old free-taking problems came back to haunt them, Connor McAilskey dropping one short, hitting one wide and goalkeeper Niall Morgan coming up the field to drive one off target from distance. Still, they managed to hold the lead for much of the first half, though never by more than two points. Donegal dragged themselves back level ten minutes before the end of normal time and they moved into the lead just before the clock ticked into stoppage time, Jamie Brennan injecting some much-needed pace into attack and clipping a point. From the restart, Niall Morgan attempted to go short, but his kick-out was intercepted by the alert McHugh, who fed Michael Murphy to score his first Championship goal since the 2012 All-Ireland final win over Mayo - a remarkable stat for such a talented forward. McHugh was a constant thorn in Tyrone sides, kicking an excellent point, making dangerous runs, changing the pace of the game and at times he grew frustrated with his own team mates as they chose to turn around and recycle the ball on the attacking ’45’ rather than letting it in quick and long. The home side went up the tunnel leading by 1-06 to 0-06, cheered by their fans in the 16,242 attendance. Donegal’s lead hovered between two and four points for much of the second half, the Paddy McGrath point to put them 1-11 to 0-10 ahead a real bonus with the moving started by a McHugh block that stopped what looked a certain Tyrone goal. The Red Hand ran their bench early and had five of their six allowed substitutes on the pitch after 52 minutes. One of those substitutes, Lee Brennan, took over the free-taking and bagged his first dead ball having already scored two from play. Fellow replacement Kieran McGeary shot over to make it a one-point game with 12 minutes to go, 1-11 to 0-13. They hit the front with ten minutes to go they hit the front, another man in off the bench doing the damage when Harry Loughran dived full-length to palm in a clever Tiernan McCann hand-pass across goals. With the last kick of the game Declan McClure added a bit of gloss to the scoreline with Tyrone’s second green flag to seal a seven-point win. Tyrone: Niall Morgan (0-01 (0-1f); Michael McKernan, Ronan McNamee (0-01), Frank Burns; Tiernan McCann (0-01), Mattie Donnelly (0-02), Peter Harte (0-01 (0-1f); Colm Cavanagh (0-01), Pádraig Hampsey (0-02); Conor Meyler, Cathal McShane, Niall Sludden; Connor McAliskey (0-02 (0-02f), Mark Bradley (0-01), Richard Donnelly. Subs: Rory Brennan for McKernan (black card) 5 mins; Kieran McGeary (0-01) for Burns 38 mins; Lee Brennan (0-04 (0-1f) for Richard Donnelly 38 mins; Harry Loughran (1-00) for McAliskey 47 mins; Conall McCann for McShane 52 mins; Declan McClure (1-00) for Sludden 67 mins. Donegal: Shaun Patton; Stephen McMenamin, Neil McGee, Paddy McGrath (0-01); Eoghan Bán Gallagher (0-01), Leo McLoone, Frank McGlynn; Hugh McFadden, Odhrán Mac Niallais (0-02); Michael Langan (0-01), Michael Murphy (1-02 (0-01f, 0-01 ’45’), Ryan McHugh (0-01); Jamie Brennan (0-03), Ciaran Thompson (0-01), Eamonn Doherty. Subs: Paul Brennan for Thompson 48 mins; Niall O’Donnell (0-01) for Mac Niallais 56 mins; Anthony Thompson for McGlynn 60 mins; Martin McElhinney for Langan 63 mins; Martin O’Reilly for McLoone 67 mins; Mark McHugh for McGrath 61 mins.